Aims: The aim of this study was to evaluate and compare the remineralization potential of bioactive-Glass (BAG) (Novamin; /Calcium-sodium-phosphosilicate) and casein phosphopeptide-amorphous calcium phosphate (CPP-ACP) containing dentifrice. Materials and Methods: A total of 30 sound human premolars were decoronated, coated with nail varnish except for a 4 mm Χ 4 mm window on the buccal surface of crown and were randomly divided in two groups (n = 15). Group A - BAG dentifrice and Group B - CPP-ACP dentifrice. The baseline surface microhardness (SMH) was measured for all the specimens using the vickers microhardness testing machine. Artificial enamel carious lesions were created by inserting the specimens in de-mineralizing solution for 96 h. SMH of demineralized specimens was evaluated. 10 days of pH-cycling regimen was carried out. SMH of remineralized specimens was evaluated. Statistical Analysis: Data was analyzed using ANOVA and multiple comparisons within groups was done using Bonferroni method (post-hoc tests) to detect significant differences at P < 0.05 levels. Results: Group A showed significantly higher values (P < 0.05) when compared with the hardness values of Group B. Conclusions: Within the limits; the present study concluded that; both BAG and CPP-ACP are effective in remineralizing early enamel caries. Application of BAG more effectively remineralized the carious lesion when compared with CPP-ACP. The caries process is well understood as a process of alternating demineralization and remineralization of tooth mineral (Featherstone 1999). The major shortcoming of currently available anti-caries products is the fact that their ability to remineralize enamel is limited by the low concentration of calcium and phosphate ions available in saliva. This has led to the research of many new materials that can provide essential elements for remineralization. Some of them are bioactive glass (BAG), casein phosphopeptide-amorphous calcium phosphate (CPP-ACP). Hence the aim of this study was to evaluate and compare the remineralization potential of BAG and CPP-ACP on early enamel carious lesion. The null hypothesis for the present study was that there is no significant difference in the mean microhardness values of the two groups. A total of 30 healthy human premolars, which were extracted for orthodontic purposes, were collected. The teeth were cleaned thoroughly to remove any deposits with scaler. Teeth were sectioned 1 mm below the cemento-enamel junction with a slow speed diamond disc. The roots were discarded and the crowns were used for the study. To remove variability in samples, 200 μm of surface enamel was removed from the buccal surface of all teeth with help of 600 grit abrasive paper and confirmed with digital caliper. A 4 mm × 4 mm working window was marked on the buccal surfaces of all the samples. Samples were then randomly distributed into two groups (n = 15). Group A: BAG containing dentifrice (SHY-NM; Group Pharmaceuticals; India) and Group B: CPP-ACP (GC tooth mousse; Recaldent; GCcorp; Japan) containing dentifrice. The area of the crown other than the working window was covered with nail varnish. B-SMH was checked with Vicker's microhardness testing machine (VMT) for all the tooth samples in the area of the working window. The indentations were made with VMT at the rate of 25 gram load for 5 seconds. The average microhardness of the specimen was determined from 3 indentations to avoid any discrepancy. D-SMH was checked with VMT, similarly as done for B-SMH. Dentifrice supernatants were prepared by suspending 12 g of the respective dentifrice in 36-mL deionized water to create a 1:3 dilution. The suspensions were thoroughly stirred with a stirring rod and mechanically agitated by means of a vortex mixer for 1 min. The suspensions were then centrifuged at 3500 rpm for 20 min at room temperature, once daily before starting the pH-cycling. R-SMH was checked with VMT, similarly as done for B-SMH. The decision criterion was to reject the null hypothesis if the P < 0.05. If there was a significant difference between the groups, multiple comparisons (post-hoc test) using Bonferroni test was carried out. [Table 1] gives us the results of comparison of microhardness within each group, from ANOVA and the P value. Mean microhardness in Group A was found to be 385.93 at baseline, 300.40 after demineralization and 371.67 after remineralization. While in Group B mean microhardness was found to be 385.73 at baseline, 314.73 after demineralization and 357.07 after remineralization. These mean values for Group A and Group B were found to be statistically significant from baseline to after demineralization (P < 0.001**) as well as from after demineralization to after remineralization (P < 0.001**). [Table 2] gives us the results of comparison of microhardness between the Group A and Group B at different phases of the study. No significant difference in mean microhardness was observed between both groups at baseline (P > 0.05) and after demineralization (P > 0.05). This indicates that the tooth samples were demineralized to almost the same level of hardness after demineralization, hence giving non-significant result on statistical analysis. However, the difference in mean microhardness between the groups after remineralization, was found to be statistically significant after remineralization (P < 0.05), indicating changes in the mineralization of the tooth samples. Despite of major advances in the field of cariology, dental caries still remains a major problem affecting human population across the globe. However caries process is now well-understood; much of it has been described extensively in the dental literature. For many years, fluorides have been used as the agent for countering carious tooth process. However recent reviews have concluded that the decline in caries may be at an end or even in reversal, with levels increasing in some areas. Thus, there is a need for developing new biomaterials which can act as an adjunct to the existing fluorides or can individually act as an agent for arresting the carious lesion and their remineralization. In the present study, we have compared the remineralization potential of two different dentifrices, which are not normally the key active ingredients in the dentifrices largely used. Even though all the specimens were sectioned from different teeth, the variations among them did not yield any major effect on the progression of demineralization. This was confirmed by the P-value obtained for all the hardness measurements (P > 0.05) before the in-vitro pH cycling commenced. It was therefore reasonable to disregard such variations when analyzing the data after pH cycling. After the treatment regime with the respective dentifrices, increase in mean microhardness was observed in both groups [Table 1]; this is in accordance with various previous studies carried out for determining the remineralization potential of BAG, ,, CPP-ACP, ,, and when compared Group A and Group B showed statistically significant values after pH-cycling regimen [Table 2]. A study was carried out to determine the remineralizing effects of BAG on bleached enamel. It concluded that BAG deposits were found on the enamel surface of all the specimens, suggesting that they may act as a reservoir of ions available for remineralization at sites of possible demineralization. This may explain the higher hardness values of BAG dentifrice after remineralization. The present study also revealed that CPP-ACP remineralized enamel lesion in human enamel in-vitro. CPP-ACP is calcium phosphate-based delivery systems containing high concentrations of calcium phosphate. However the lower hardness values for CPP-ACP may be due to its amorphous nature; which does not adhere to the enamel surface, unlike BAG gets attached to tooth, hence not remineralizing the tooth surface for a longer period of time to enhance its hardness. A study investigated the enamel remineralization potential of CPP-ACP and BAG, showed that, after scanning electron microscope analysis it was clearly seen that although both group samples had plugs that sealed the fissures formed by demineralization, BAG plug appeared to be more compact and intimately attached to the enamel surface. The deposits formed by CPP-ACP were smaller and amorphous, while BAG created larger, more angular deposit. This may also explain the high values of hardness for BAG as compared to CPP-ACP in the current study; as BAG attaches more intimately and compactly to the tooth surface. Under the current in-vitro experimental conditions it can be concluded that both BAG and CPP-ACP are capable to remineralize early carious lesion and also that BAG has a better remineralization potential than CPP-ACP. 1. Petersen PE. Socio-behaviour risk in dental caries - International perspective. Community Dent Oral Epidemiol 2005;33:274-7. 2. Winston AE, Bhaskar SN. Caries prevention in the 21 st century. J Am Dent Assoc 1998;129:1579-87. 3. Hench LL, West JK. Biological application of bioactive. Life Chem Rep 1996;13:187-91. 4. Reynolds EC. Casein phosphopeptide-amorphous calcium phosphate: The scientific evidence. Adv Dent Res 2009;21:25-9. 5. ten Cate JM, Duijsters PP. 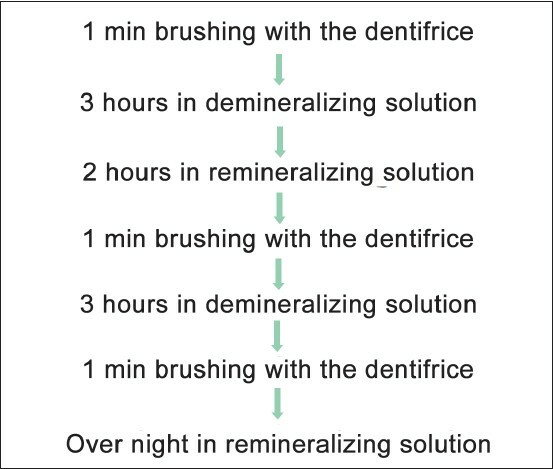 Alternating demineralization and remineralization of artificial enamel lesions. Caries Res 1982;16:201-10. 6. Itthagarun A, Wei SH, Wefel JS. The effect of different commercial dentifrices on enamel lesion progression: An in vitro pH-cycling study. Int Dent J 2000;50:21-8. 7. Hara AT, Magalhães CS, Serra MC, Rodrigues AL Jr. Cariostatic effect of fluoride-containing restorative systems associated with dentifrices on root dentin. J Dent 2002;30:205-12. 8. Paes Leme AF, Tabchoury CP, Zero DT, Cury JA. Effect of fluoridated dentifrice and acidulated phosphate fluoride application on early artificial carious lesions. Am J Dent 2003;16:91-5. 9. Lata S, Varghese NO, Varughese JM. Remineralization potential of fluoride and amorphous calcium phosphate-casein phospho peptide on enamel lesions: An in vitro comparative evaluation. J Conserv Dent 2010;13:42-6. 10. Itthagarun A, King NM, Yuen-Man Cheung. The effect of nano-hydroxyapatite toothpaste on artificial enamel carious lesion progression: An in-vitro pH-cycling study. Hong Kong Dent J 2010;7:61-6. 11. Koulourides T, Feagin F, Pigman W. Remineralization of dental enamel by saliva in vitro. Ann N Y Acad Sci 1965;131:751-7. 12. Arend J, Cate JM. Tooth enamel remineralization. J Cryst Growth 1981;53:135-47. 13. Bagramian RA, Garcia-Godoy F, Volpe AR. The global increase in dental caries. A pending public health crisis. Am J Dent 2009;22:3-8. 14. Featherstone JD, Shariati M, Brugler S, Fu J, White DJ. Effect of an anticalculus dentifrice on lesion progression under pH cycling conditions in vitro. Caries Res 1988;22:337-41. 15. Ten Cate JM. In vitro studies on the effects of fluoride on de- and remineralization. J Dent Res 1990;69 Spec No:614-9;634. 16. Vahid Golpayegani M, Sohrabi A, Biria M, Ansari G. Remineralization effect of topical novamin versus sodium fluoride (1.1%) on Caries-Like lesions in permanent teeth. J Dent (Tehran) 2012;9:68-75. 17. Rahiotis C, Vougiouklakis G. Effect of a CPP-ACP agent on the demineralization and remineralization of dentine in vitro. J Dent 2007;35:695-8. 18. Tantbirojn D, Huang A, Ericson MD, Poolthong S. Change in surface hardness of enamel by a cola drink and a CPP-ACP paste. J Dent 2008;36:74-9. 19. Walker G, Cai F, Shen P, Reynolds C, Ward B, Fone C, et al. Increased remineralization of tooth enamel by milk containing added casein phosphopeptide-amorphous calcium phosphate. J Dairy Res 2006;73:74-8. 20. Gjorgievska ES, Nicholson JW. A preliminary study of enamel remineralization by dentifrices based on Recalden (CPP-ACP) and Novamin (calcium-sodium-phosphosilicate). Acta Odontol Latinoam 2010;23:234-9. 21. Andersson OH, Kangasniemi I. Calcium phosphate formation at the surface of bioactive glass in vitro. J Biomed Mater Res 1991;25:1019-30. 22. Burwell AK, Litkowski LJ, Greenspan DC. Calcium sodium phosphosilicate (NovaMin): Remineralization potential. Adv Dent Res 2009;21:35-9. 23. Gjorgievska E, Nicholson JW. Prevention of enamel demineralization after tooth bleaching by bioactive glass incorporated into toothpaste. Aust Dent J 2011;56:193-200. 24. Grenby TH, Andrews AT, Mistry M, Williams RJ. Dental caries-protective agents in milk and milk products: Investigations in vitro. J Dent 2001;29:83-92.